The sign of Capricorn is a stable and solid sign of Earth and is at this time for open wounds a sigh of relief, a timeout needed to catch the breath and realize that basically everything is fine. Open wounds are memories that crop up and this time we can finally manage to go through with the trip of liberation from the pain that afflicted us once, simply because we are now more mature and focused on us. Thanks to the solid values of this sign, we go back with our feet anchored to the ground. Our jobs will require specific needs in this period and this needs attention, because soon many of us will close for the holidays. 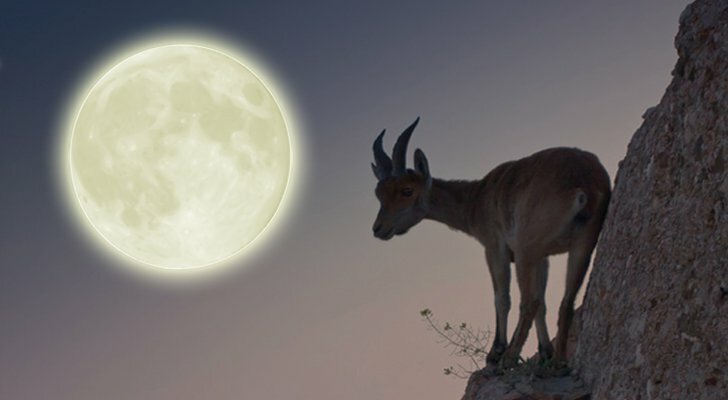 What will the Full Moon in Capricorn bring to the various signs? ARIES – You have a question in your throat and almost afraid to hear the answer. For how much time you want to continue living in a constrictive situation and unsatisfactory, both at work and in love? Know that a drastic drop is not necessary, just that you to be more and more yourself and to stop always putting others first. TAURUS – The Full Moon in Capricorn can raise the desire for motherhood for this sign and many could be settle. For all others it is a golden dawn in a period that is becoming more interesting from several points of view. Formulate wishes that you have desired for a long time, believe it and they will come true. GEMINI – At last your head becomes lighter and you can taste the joy of living that always accompanies you. The difficult moment is gone, now look at the deep gifts he has brought you with him and look down to see the Life through the eyes of the Heart: there will appear rainbows! Professional achievements at the horizon. CANCER – The full moon casts a new light on you and enables you to take an important step out of the much-loved comfort zone. Sometimes shifting attention elsewhere serves to capture richly nuanced and interesting existence, and to you who are so creative it is necessary to be able to dream. Allow it to yourself! LEO – Surrender yourself to the feelings of love and spontaneous satisfaction that flow into you. Venus and Mercury in the sign will help you create a new project that speaks of love and harmony. Begin by placing the precise limits between you and the outside world, so as to define you and give you a new starting point. VIRGO – The Full Moon gives strength to the new flow that has been open in your days. If you still feel lost it is because you are in the process of settling. Do not rush, everything is perfect as it is and everything is finding its best possible position. Observe from outside the perfection that is taking shape. LIBRA – Your delicate nervous system has been tested by the emotional intensity of the past few days and now the full moon will not spare outlets awareness that sometimes leave you breathless, even though they are necessary for your growth. Try to pamper yourself to the fullest and be understanding with your idiosyncrasies. SCORPIO – The Full Moon gives you the opportunity to consolidate all of the intimistic analytical work you brought forward recently. You are traveling even within yourself, in the deepest meanderings. Breathe much and concentrate on the fact that you are freeing yourself to get to live much lighter. You will soon be on a very interesting new way. SAGITTARIUS – Time to build what you have planned so far. The Full Moon opens the way to bring the event to all that you have taken care to cultivate in recent months. Remember that you are under the transit of Saturn Soul Master, you are driving yourself to become masters of your life. CAPRICORN – The Full Moon in the sign opens the door to integrate all that love you ever wanted to feel and express, but of which you haven’t felt worthy. Breathe for a moment and feel how the force of tenderness can rise to the surface to warm your body. Realize that love is already there! AQUARIUS – Intense dream time, time to see manifested symbols and magic, as if life would turn from inside and show the luminous reality usually hidden behind the everyday events. Be enchanted by this unusual view because a new understanding will be opened of what you came here to do. PISCES – If you feel in reverse this summer is because it’s time to go over with your mind the events that you have not taken into proper consideration for your personal growth. You will review your life and feel the need to forgive and to make amends to it, so let go forever pain and melancholy, Open to joy. Please share with your friends and family what the Full Moon will bring them!